Look who we spied in our children’s room the other day, just hanging out talking about books. We live in a pretty great state. This summer have unfettered access to professional children’s authors, all in the name of charity! Saturday, July 19 several local authors will host a Writing for Charity event in Salt Lake City, with all profits going to The Wheelchair Project. Come hear writers talk about their process, how to write for a young audience, storytelling tips, and the ins and outs of the publishing business. In addition, have your picture book text or first page of your novel (the most important page!) workshopped by professionals. 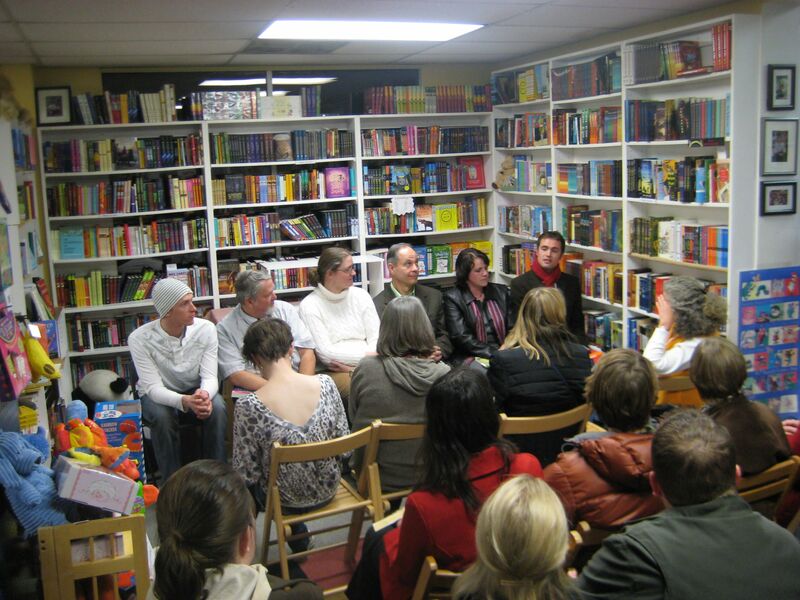 Authors and publishing professionals include Brandon Mull, Shannon Hale, Mette Ivie Harrison, Ann Cannon, Kristyn Crow, Becky Hickox, Kimberley Heuston, Anne Bowen, Aprilynne Pike, Laura and Tracy Hickman, Ann Dee Ellis, Mike Knudson, Sydney Husseman, Chris Schoebinger (editor), Amy Jameson (agent), and Wendy Toliver. Space is limited, first come first serve. To reserve your spot, mail in the $45 registration fee. Make checks to: “LDS Philanthropies” (the organization that runs The Wheelchair Project) and write “Wheelchair” in the memo line. Also include: Your name, age, phone number, and area of interest–picture book writing, fantasy novel, or realistic fiction novel. On the day of the event, bring 15 copies of the first page of your novel or picture book text (maximum word count: 300 words) for some hands on workshopping. If you don’t have a first page to workshop, don’t let that stop you! 100% of the proceeds go to The Wheelchair Project, a wonderful charity that donates new wheelchairs to people in third world countries, many of whom have never had one. A wheelchair can completely change the life of a disabled person, offering mobility, increased independence, and a chance to go to school or find employment. Because this charity is administered by volunteers with LDS Philanthropy, there is no overhead and every penny donated goes directly to purchasing wheelchairs. This is not a religious charity–the wheelchairs go to the needy regardless of their faith. Thank you for supporting this extraordinary cause! ‘Salt Lake City Reads’ Authors Announced! Judge Valdez and Shannon Hale will both be at our Holiday Party tonight, so stop by for some food, some drinks, some signed books, and some holiday cheer!